This week ShoreGroup participated in National Salute week, a U.S. Department of Veterans Affairs program that pays tribute and appreciation to the over 98,000 Veteran patients across the United States. Every February, thousands of people participate in a variety of activities at VA centers to help support Veterans and the institutions that care for them. ShoreGroup employees were happy to join in these volunteer efforts this year. “We are thrilled for the opportunity to give back to our communities and to the men and women who have served our country,” said Jeff Ortolano, senior vice-president of sales. I’ve been volunteering for much of my life. One thing I’ve learned through volunteering is that I always feel better when I’m connected to a purpose larger than my own. I believe most humans are hard-wired this way and find true rewards in giving to others. This was exactly my experience volunteering at the local VA this week. Taking a few hours out of my day to connect with others and briefly experience their world from their perspective, I was reminded that there’s more to life than my own “small” problems. 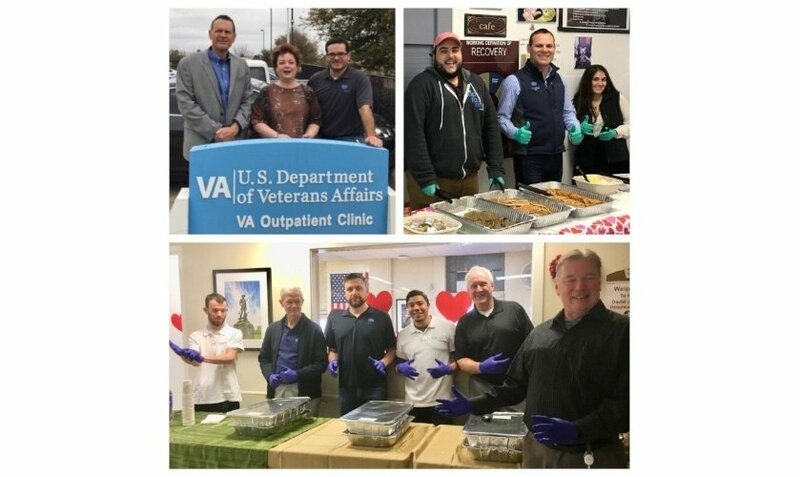 I arrived at the VA medical center with a group of my ShoreGroup colleagues to serve lunch and offer fellowship to the Vets living on the hospice floor. I had never been to a hospice center before and wasn’t sure what to expect. I then met three of the residents, each in their nineties. Despite their age and situations, their spirits were bright and their minds as sharp as ever. It wasn’t long before one of them started telling me stories about his World War II service. After a few minutes, I felt like I was talking to my own father. My dad was a World War II Vet as well but passed away almost 20 years ago. Unexpectedly, I felt a sense of comfort from hearing this man’s stories—an almost too familiar presence—as we continued talking. Next, I spoke to a younger gentleman who served in Vietnam. After a few minutes, he told me that he was a hospice patient. He was trying to stay upbeat but it was clear that he was struggling to reconcile his health prognosis. I was glad to hear that he had family visiting him on a regular basis. He then asked me if I had kids and I replied, “Yes.” He listened attentively as I told him about some of my most recent parenting trials and tribulations. As I spoke, I could see him forget about his own circumstances. He even offered me heart-felt words and advice. I couldn’t help thinking, “Who is helping whom?” As I gave my new friend a hug goodbye, he shared how grateful he was that we met. I was deeply touched by the whole experience. As I drove home, I thought about how fortunate I was working for a company that promotes this notion of “giving back.” It also reaffirmed my belief that we’re indeed hard-wired to connect with and help one another. More than 50 ShoreGroup employees participated in National Salute activities. Everyone came home with their own stories and felt good about their own experiences as well. I appreciate working for ShoreGroup because it’s a company that cares about its people and communities. I’m looking forward to going back next year. Vanessa Kirchner-Leida is the Digital Marketing Manager at ShoreGroup. Her tech experience spans both the collaboration and security space. Besides her interest in technology, she enjoys the power of content. Specifically, how it connects people and builds relationships. Prior to her marketing career, she worked in both sales and customer service and holds a communication degree.